Why would anyone want to call Boise home? It's gorgeous for one. View of downtown Boise from the Train Depot in late October. Boise is the center of commerce for the state of Idaho. Careers - Numerous companies call Idaho their home base. These are not limited to Hewlett Packard, Micron Technology, Boise Cascade, J.R. Simplot, Winco, Albertsons and The Washington Group. Population - the 2016 Census estimated 223,159 people reside within the city. Within the Boise metropolitan area there is approximately 616,500 people. Boise is the 3rd most populous city in the Pacific Northwest, falling only behind Seattle and Portland. Endless Outdoor Activities - Whether it be camping, fishing, mountain biking, floating the river, walking the miles of trails, skiing or snowshoeing, there is always something fun to do without having to travel far. And if that's not enough, try biking on the 25 mile long greenbelt that runs along the Boise River. College town - Boise is home of the Boise State University Broncos, who are known for their football team. The influx of college students can be seen each fall, and is a welcome sight to the community. BoDo - Downtown Boise has a phenomenal reputation for its cleanliness and various retail stores. BoDo is a section of downtown that offers entertainment, restaurants, shopping and more. 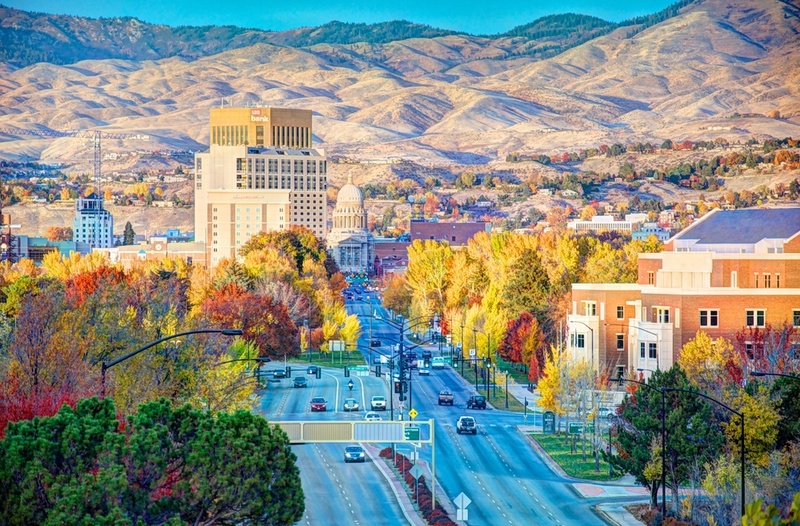 The Arts - While it is not New York City, Boise is home to a ballet, an Opera House, a philharmonic orchestra, Boise Art Museum, Boise State Morrison Center and the annual Shakespeare festival- an outdoor amphitheater which seats over 770. Semi-Arid Climate -the Treasure Valley (the greater Boise area) offers four distinct seasons with cold winters and hot summer days. Violent Crime- in 2010, Boise had just over HALF of the national average according to CNN Money, which is rather impressive for a city of its size. History- Boise was founded in 1863, and later incorporated in 1864. Fort Boise was a defense erected by the Hudson's Bay Company in 1830's. It was abandoned i the 1850's. Massacres along the Oregon Trail spurred the US Army to re-establish the fort in 1863 during the Civil War. Ranking- in 2010, Boise was ranked #3 in the Nation for "Places to Retire" according to CNN Money. 80 square miles - The City of Boise is 80 square miles in size, 79.25 square miles being land, and 0.75 being water. Elevation- Boise is considered high desert and sits 2,730 feet above sea level. Pronunciation- Locals pronounce the city's name as (boy-see) where as outsiders tend to pronounce it as (boy-zee). So, if you are considering a move to Boise or just do not want to stick out like a sore thumb on a visit, practice your pronunciation before boarding your plane.